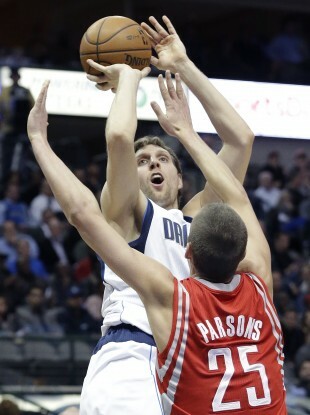 The German says Chandler Parsons is spending his money. THE DALLAS MAVERICKS made waves around the NBA this off-season when they gave Chandler Parsons a massive three-year, $46 million (€36.1M) contract, to lure him from the Houston Rockets. That deal was made possible by Dirk Nowitzki, who took a $15 million pay cut to help the Mavericks maintain cap flexibility to go after a big-name player like Parsons. Nowitzki was the second highest-paid player in the NBA in 2013-14, making $22.7 million. His new three-year, $25 million (€19.6M) deal with the Mavericks will pay him around $8 million per year. Parsons is now the highest-paid Maverick, making $14.7 million (€11.5M) this season, followed by Tyson Chandler, Monta Ellis, and then Nowitzki. So Nowitzki (the Mavericks’ all-time leader in games, minutes, three-pointers made and attempted, and points) actually has plenty of people to take him out to dinner this year. Email “Dirk Nowitzki took a massive pay cut this year, and he's not about to let anyone forget about it”. Feedback on “Dirk Nowitzki took a massive pay cut this year, and he's not about to let anyone forget about it”.